It’s the time of year when I plant up my window boxes. This will be their 3rd summer season, after Mr MBaF very kindly made them for my birthday in 2014. The boxes on the dark, north-facing, front of the house have always presented me with a bit of a challenge. Last year trailing fuschias performed fairly well, particularly outside the upstairs (bedroom) windows, so I’ll be using them again up there. But I’m taking a different approach in the darkest spot, outside the living room. I’ve been mulling over trying smaller-leaves hostas in there for a while. The challenge was that I know hostas like to have nice moist, rich, soil. But window boxes are prone to drying out, and already in the box are a couple of ferns, which like a lighter soil (I believe). My solution has been to try creating a micro-environment that suits the hostas. So, I cut a deep bottom off two 2 litre plastic milk cartons, filled them with garden compost and manure, and plunged them into position in the boxes. The milk carton bottoms have a rectangular cross-section, which fits perfectly into the window box. Then I split one of the smaller hostas from a collection I’ve been growing in a tin bath. Prizing the bugger from the bath was tricky, but splitting it was pretty easy – just a stomp down between the shoots, into the rootball, with my spade. I planted the hosta-halves on top of/in the manured milk cartons, topped up with multipurpose compost mixed with garden compost, and hey presto. I planted them a week or two ago, before any leaves had burst forth, and they’re already looking great. Alongside them are the ferns, trailing nepeta and silvery lamiums – which the bees love if they flower. Fingers crossed everyone plays nicely together and I have a verdent, fresh and jungly outlook from my living room all summer! First day of ‘heavy lifting’ in the allotment today. And it was a lovely day for it. 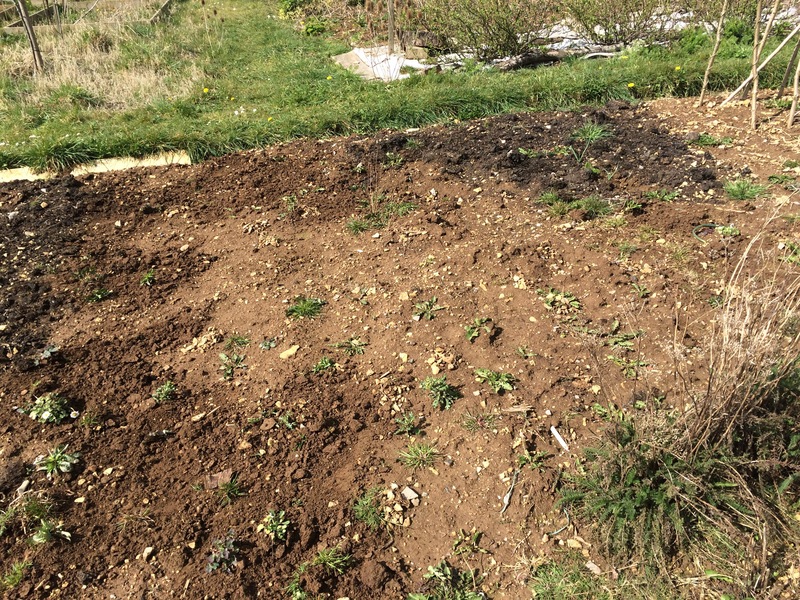 I’m sharing the hire of a rotavator in mid-April, but I didn’t think my well-chitted first early potatoes (Lady Cristl and Anya) could wait that long to get in the ground. Three hours of weeding, digging, raking, furrowing and planting and I am a WRECK! Aching, stiff and exhausted. Though my body is crying, I’m dead pleased to have got that job done for another year! It’s that time of year again when the impatience to get growing forces us to cram windowsills with those sissy species that insist on home comforts. My home was clearly not designed by horticultural enthusiasts. It has a woeful lack of windowsills, so I am mostly trying to sit on my hands until we’re risk-of-frost-free and I can sow outside. 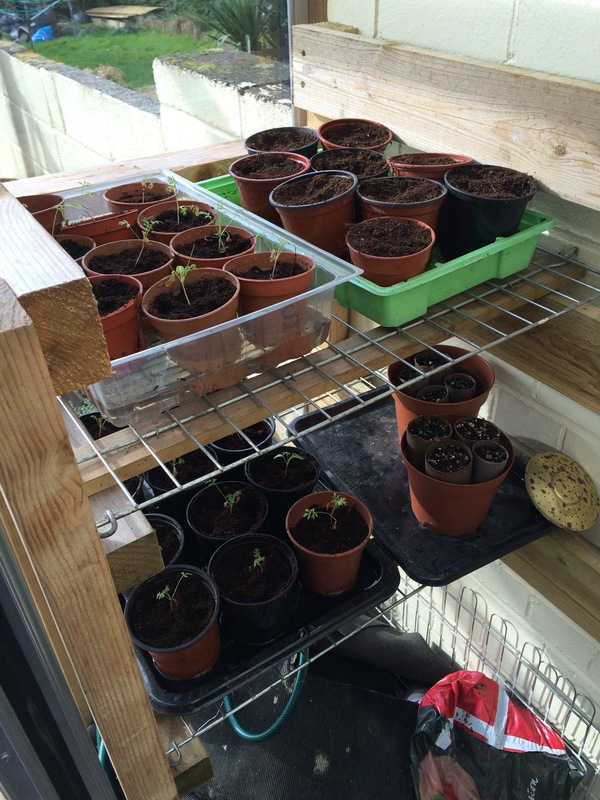 But I wouldn’t want to avoid the annual(s) invasion altogether, so IN MY NEW POTTING SHED (!!!) I sowed a tray of modules with zinnias and cosmos. All of these seeds were free; mixed zinnias and cosmos from Gardeners World magazine this year and last, and white cosmos purity collected from my garden (in 2014 – time will tell if they’ll still be viable). That tray of annuals is balanced – half on the windowsill and half on ‘The Idiots Guide to the Internet’ (circa late-1990s) – in my office. The zinnias shot up in days, and are now squishing themselves leggily against the polythene cover, waiting for the cosmos to catch up! Next to them is a lasagne dish of plug plants, which are balanced on the Good Beer Guide 2012. It sure is a professional horticultural outfit here! These are my money-saving windowbox solutions. With a lack of space and time for bringing on loads of annuals from seeds, I buy the early annual plugs from the garden centre (£1.49 each, and less if you multibuy) and grow them on inside and then in our unheated greenhouse. I’ve chosen trailing fuschias once again for our tricky north-facing window boxes. I dislike the other obvious choice for shade – begonias – and fuscias did pretty well last summer. For the sunny side of the house, I’ve gone with bright red trailing geraniums. It’s a real sun trap and I think it deserves a hot colour. Petunias have done brilliantly in the past, but the process of dead-heading them is such a horribly sticky job that I’m changing my allegiance. Despite my dislike for begonias I’ve bought a few apricot-coloured ones to go in hanging planters at Miss MBaF’s Preschool. It’s a semi-shaded spot, and I needed something that would flower before the children break up for summer hols. 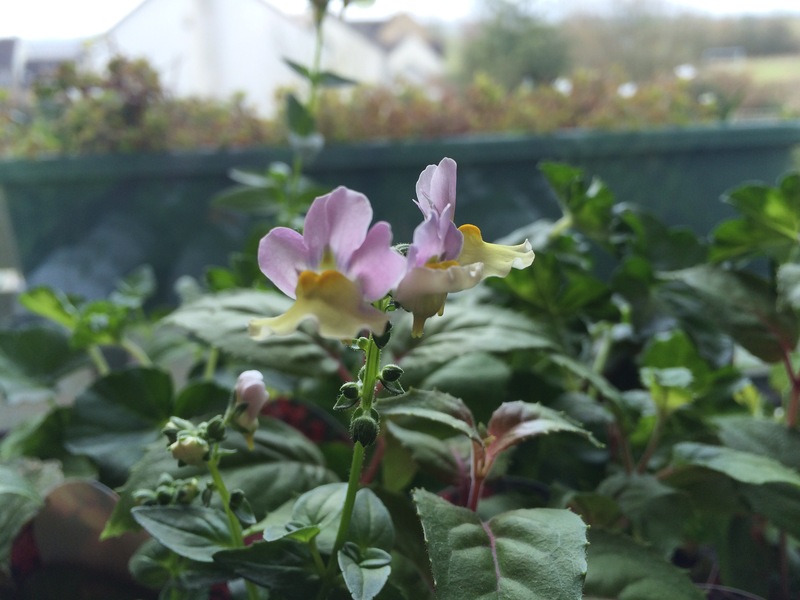 To tide us over until the begonias go in I’ve chosen some pretty nemesia. 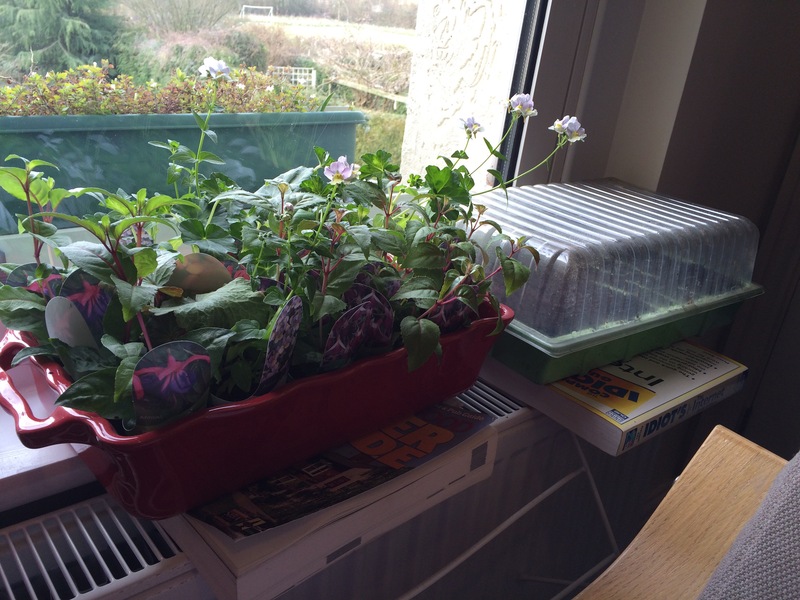 It’s too cold for them outside now, but they’re already flowering away happily on the windowsill. Next up I’ll have to clear the kitchen windowsill and get the tomatoes started! 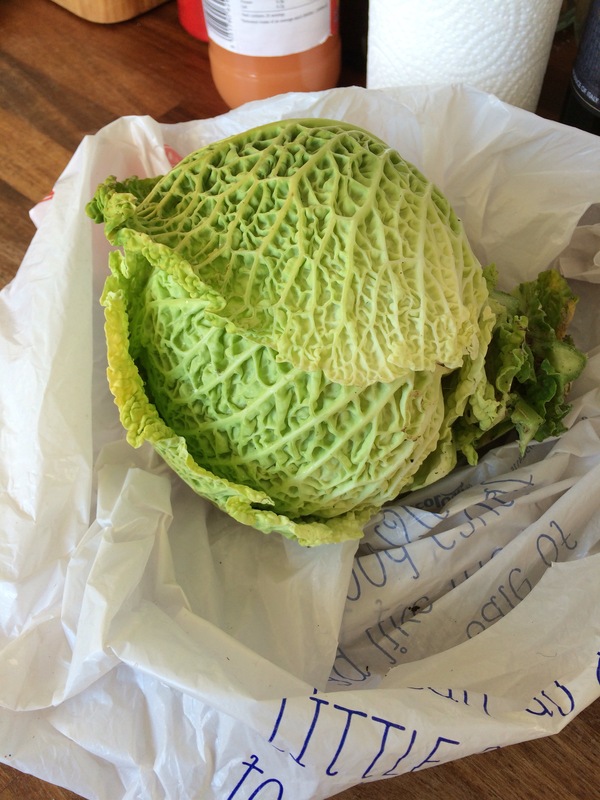 One of autumn’s little savoy cabbages (Traviata) has stood, ignored, since Halloween. I assumed it was half eaten by slugs by now. We’re having rump steak and blue cheese sauce tonight – doesn’t everyone on a Monday?! 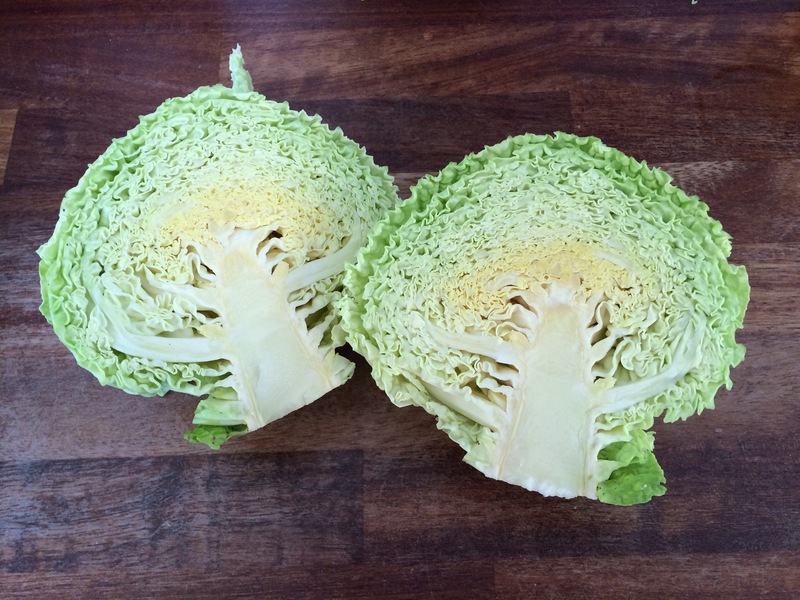 – so Savoy cabbage seemed the perfect accompaniment. “I’ll just check that one at the allotment, on the off chance…” I said, on the way to the shops. Bingo! What a little trooper! Luckily for him, our mutt Harris is still intact. But today was the day for the dogwood to get a grade 1 all over. 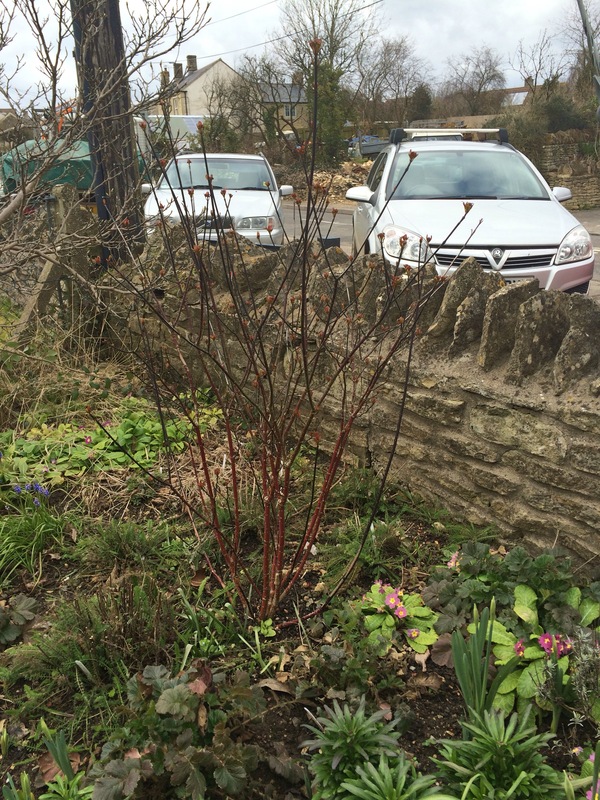 Three years ago I bought the darkest black-red stemmed cornus (posh name for dogwood) shrub from the sadly extinct garden centre at nearby Westonbirt Arboretum. Westonbirt boasts stunning swathes of fiery red, yellow and orange-stemmed cornus that sizzle all winter. I hoped to transfer a bit of that drama into my own patch – as you do. A single dark shrub in my roadside front garden is a lame attempt, but I’m attached to its simple form and winter colour. When I bought it, the helpful salesman told me to plant out and leave it alone for a couple of years before chopping it down hard in spring to keep the deep stem colour. It’s obvious why. The oldest wood had turned bright red, while the new growth was much darker. It created quite an attractive colour transition – I think they call it ‘ombre’ in interiors! But today was the day. I seized the loppers and chopped all the stems down to 2in from the ground. I expect the deep dark stems to start shooting up over spring, before we get the simple, small red-orange leaves, and clusters of whitish berries later in the season. 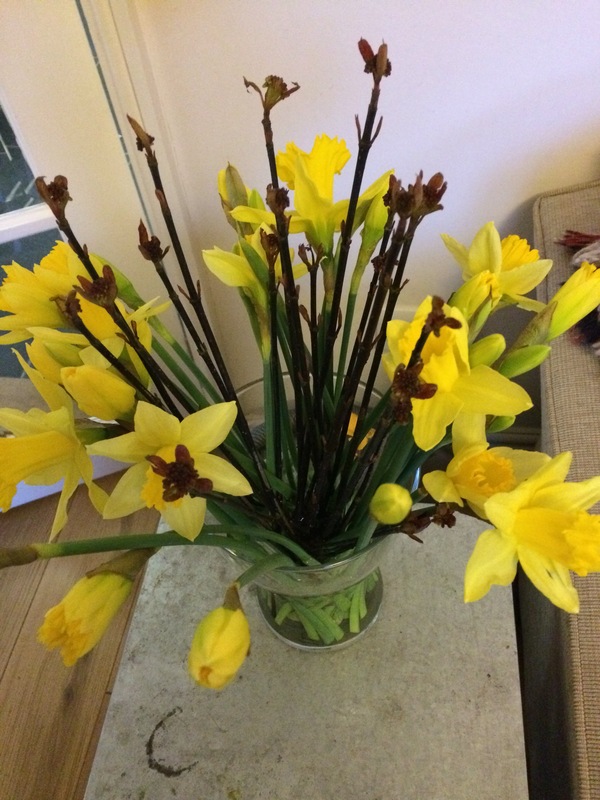 It seemed a shame to ditch the beautiful trimmings, so I snipped the ends off and added them to a big vase of daffs in the living room. It sure has been a quiet winter on the MBaF front. I’m a fair-season gardener for sure, and even my Gardener’s World magazines festered largely untouched some months. But for a few hours, on a couple of recent days, the feeling of spring’s approach has begun to cajole these green fingers to flex. Today has been one of those days, and it happened to coincide with no work and Miss MBaF at nursery. I couldn’t deny it any longer. Seeds. Were. Sown. Hello 2016, and in Delia Smith’s immortal words: Let’s be avenue! Pea Douche Provence sown. Over-wintered Nigella potted on. 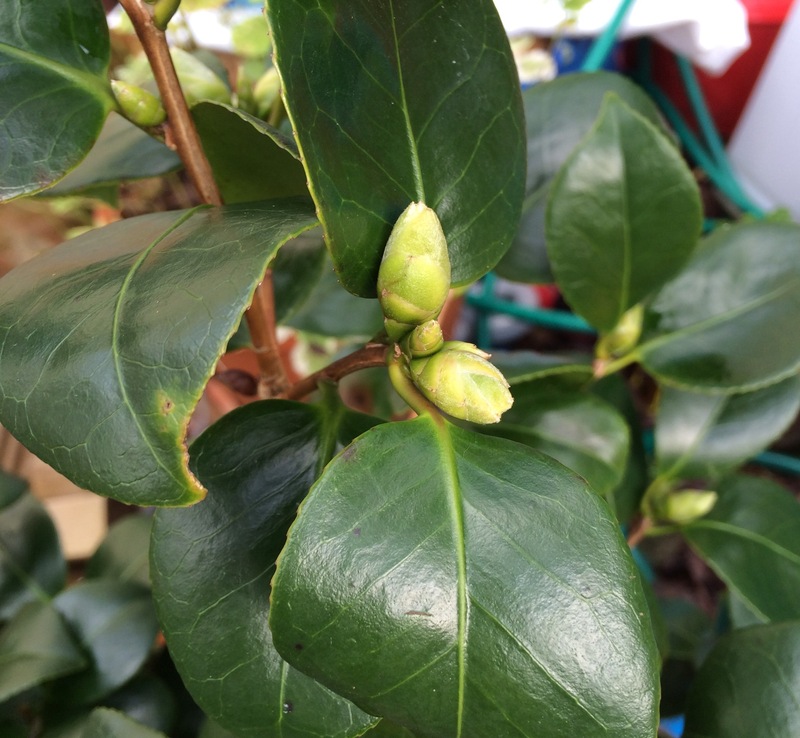 This month I’ve been making sure to water my potted camelia every week (even with all the rain). 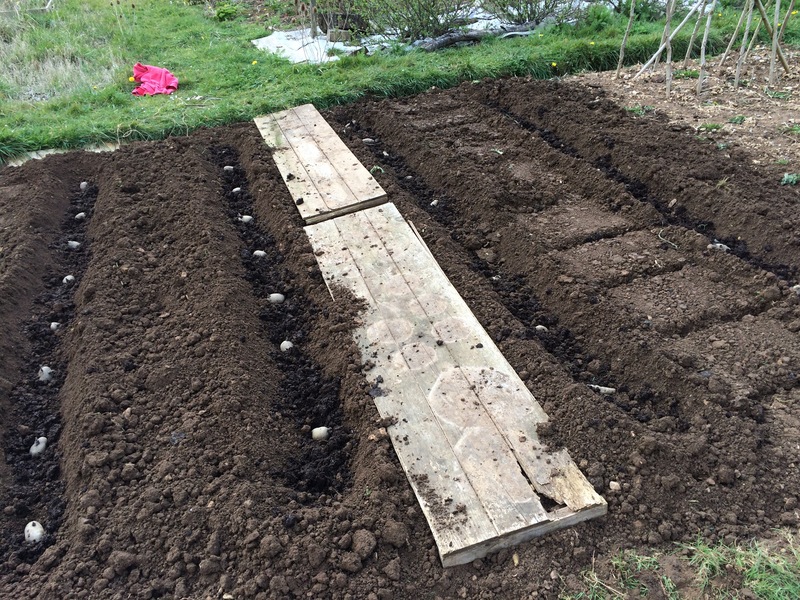 Monty Don reminded me of this task on one of the final Gardeners’ World episodes of the year. This time I listened. 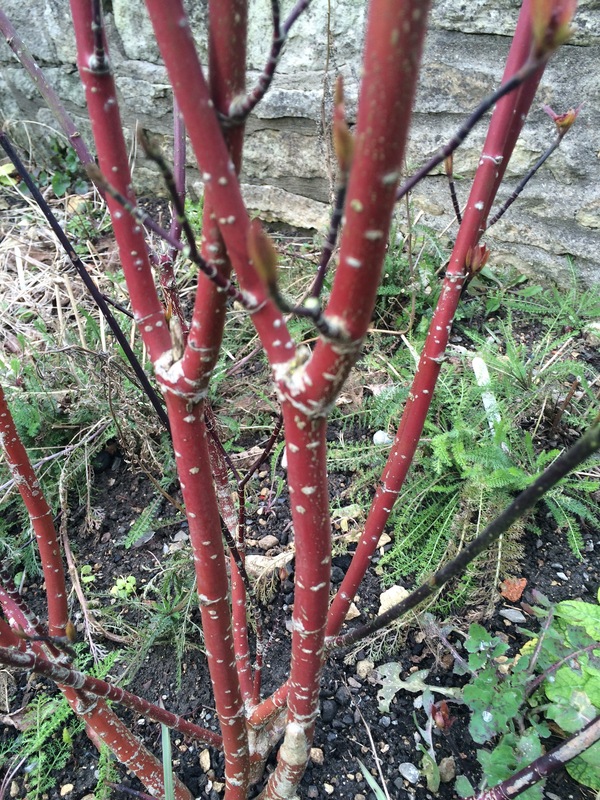 Last year I didn’t listen, and all of the buds shrivelled up and fell off. In spring I was left with a single flower. So I’m taking good care of the fattening buds, and expect to be rewarded with a splash of pink in early spring, when little else in my garden is flowering.